I don’t know why no one ever references the data, but a global experiment was recently performed to test whether or not human emission of CO2 from the use of hydrocarbon energy was the cause of the increase in atmospheric carbon dioxide concentration. The experiment was the global massive increase in oil prices which caused the massive decrease in global oil consumption which occurred about ten years ago. There are charts you can find out there which show the global consumption of oil taking a massive downturn as the price per barrel continued to rise and rise to quite absurd levels. Separately, there are charts you can find out there which show that the CO2 concentration in the atmosphere continued rising perfectly along the trajectory it has been for the last several decades during this same time period. You can simply visually look at these charts and conclude that the human contribution to the CO2 increase must be negligible, given that the massive reduction in human oil consumption during that period had no distinguishable effect upon the rise in CO2 concentration. If you were a mathematician and you had the required data, it would likewise be easy to statistically establish that, given these facts, and given the numbers involved and the requisite statistical tests, the likelihood that humans are the cause of the CO2 increase is quite small indeed. In fact, I put forward that that was what the entire global oil price sky-rocket of ten-years ago was about. I do in fact believe that it was a test conducted on purpose, utilizing directed speculation in the markets to cause this effect on global oil consumption, so that the statistical test could be performed as an actual global empirical experiment. Gallery | This entry was posted in Fraud of the Greenhouse Effect and tagged oil. Bookmark the permalink. Joe, I just came across this link a day ago. It is an e-mail exchange from Dr. Happer to Dave Burton. In it Dr. Happer destroys the backradiation myth. You might want to do an article on this! Joe, you are welcome. That last post was from my wordpress account (Immortal600). That’s the handle I use to argue with the AGWGHE clowns. I get tons of grief for claiming that a GHE doesn’t exist. Keep up the good fight, Joe !!!! We will destroy these charlatan quack tyrant loser freaks! Since we are on the subject of reality (^_^), I thought I’d re-post something that I posted at ClimateOfSophistry, in another thread, but I’m not sure whether anybody who might be interested goes into that thread anymore to read it. This was inspired by the Green New Deal/No Deal crap and the seemingly escalating stupidity of the political leaders in power. I attended UNC for a couple of years, by the way — started studying math there, before I switched gears in a major way. “I don’t know why no one ever references the data…” I think you know why they didn’t. The same reason why they pay people to attack every social media site that opposes global warming. Has anyone ever wondered how they know to go to the most obscure web site and attack any opposition? I’m guessing a program and bots. That costs a lot of money to maintain. Weird the “science is settled” but how much is spent on “damage control”. Hmm. The science was settled on CO2 not being the trigger for global warming a long time ago. Now only propaganda keeps it alive. Thanks, Joe, for posting a link to your book at my latest commentary on the craziness. Doc Snow wrote a comment to totally dismiss it, but that comment somehow seems to have disappeared — I did not delete it — I wanted it there, so I could respond to it. It was a snide dismissal much deserving of a snide retort. Robert, Doc Snow may be a bright guy but he hasn’t a clue. Zero understanding of thermodynamics and his attempt to compare the atmosphere contents to medicine in the human body is typical apples to oranges comparison. That right there shows his shallow understanding of climate change. Kudos for being civil with the clown despite his snarkyness. Robert, I saw his snarky comment on Joe’s book. He can’t intelligently address the science. Thankfully, I can muster up some civility, as I have not reached my civil breaking point yet, which is, I suppose, attributable to my rank amateur status in all this. (^_^) In other words, I totally understand how highly educated, professional physicists, with a proper understanding of their field, could loose it. Has anyone looked into whether estimates of co2 emission by industry is done correctly? Cloud cover has decreased by 1.5% from 1983 to 2010. Clouds are responsible for 20% of emission. It’s too bad we don’t have cloud cover data going back more than 40 years, otherwise we’d readily see why it’s been getting hotter for over 200 years. Am I wrong? Doesn’t this seem to be the best explanation? Please explain. Joe, I got along with you fine until “so that the statistical test could be performed as an actual global empirical experiment”. I’m a sceptic [not a skeptic], so you’re not wasting your time. Not quite getting your question William. One can think of the massive oil rally and corresponding reduction in usage of about 10 years ago as a global experiment to empirically test via the appropriate statistics as to whether human consumption of oil is the cause of the increasing CO2 concentration. The results are that humans are not the cause. So in my simple mind less clouds would equal less heat wouldn’t it? 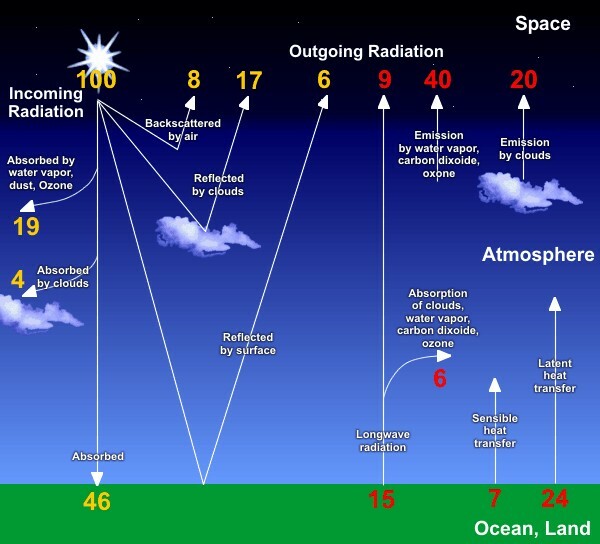 If water vapor is the only means for clouds and it’s not being formulated the overall heat is less not more world wide? Or am I missing something? Zoe Phin.. Your approach makes sense to me as well as nicely satisfying Occam’s razor. Another way is to consider how H2O affects the atmosphere’s lapse rate. If there was no H2O in the air, then the adiabatic lapse rate would equal the gravitational constant or 9.8K per km. But our air is moist not arid and so the actual lapse rate is 6.5K/km. This is to say, that H2O makes the surface about 36 degrees COLDER (i.e. say 11km times 9.8 less 6.5). Of the two major GH gases we can say (1) H2O decreases the surface temp; and (2) CO2 has zero impact. The radiative GHE does not exist. Either “sceptic” or “skeptic” is correct. I was not aware of that, until now. The energy vector diagram you show has the same conceptual error that exists in the standard diagram of Kiehl, J.T and Trenberth, K.E., (1997) Fig.7. It assumes that Latent Heat Transfer is a one way process. In making this assumption only half of the hydrological cycle is represented in the diagram. It is literally impossible for latent heat transfer to occur without vertical mass movement of water vapour. So either there is a lot of water being pumped up into the atmosphere which magically stays there, or what goes up must come down. All mass falling in a gravity field converts potential energy into kinetic energy, so the descending rain must deliver energy back to the surface. When it falls back on to the land surface the water still possesses potential energy relative to its sea-level datum. This energy is used to erode the continents, move sediments back to the sea and of course create the small amounts of hydroelectric power from the water stored behind the dams we have built. Now we also need to acknowledge that the vertical thermals (sensible heat transfer) in the diagram are also mass movement processes in a gravity field, and so air descending to the surface in high pressure weather systems is also returning energy back to the surface. Neither of these energy delivery systems of hydrology or meteorology are represented in the diagram.